The section below is from my page about Foreign Watches with British Hallmarks. It describes an unusual type of British hallmark that was specified to be used on all imported gold and silver watch cases from 1 January 1888 until 1 June 1907, but is very rarely seen. There may have been only a handful of watch cases marked with this hallmark. I have been on the lookout for these marks for years. I have now seen a second, but that is still only two so I think it still qualifies as The Rarest British Hallmark! Birmingham Assay Office "Foreign" Hallmark. Click image to enlarge. As a result of pressure from English watchmakers, the British Merchandise Marks Act of 1887 introduced new hallmarks that were to be used on ‘foreign’ gold and silver watch cases sent to British assay offices for hallmarking. This applied only to watch cases, and all watch cases sent to an assay office had to be accompanied by a declaration of the country in which they had been manufactured so that any foreign cases were clearly identified. The form of the marks to be applied was specified by an Order in Council. Instead of three separate punches for the town mark, the standard mark and the date letter, all three elements were combined into a single punch mark. This was intended to make it more difficult to subsequently alter the mark. And just to be sure that there could be no doubt about the origin of the watch case, and therefore the watch itself, the word FOREIGN was placed prominently at the centre of the punch mark. The large single punch used instead of three separate, smaller, punches would have caused significantly more distortion to the watch case where it was struck, requiring more work to rectify the case after hallmarking. I know that the Birmingham Assay Office prepared punches ready to stamp these marks. I have been on the lookout for a watch case actually hallmarked with one of these ‘Foreign’ hallmarks for many years, but they are rare. This is principally because very few watch cases received the frankly ugly and derogatory "foreign" hallmarks, but also because very few people recognise them as hallmarks. I finally found a watch with the hallmarks shown in the image here, and then more recently a correspondent sent me details of a watch with the mark shown in the smaller image. The large composite octagonal mark is the hallmark designated by Order in Council to be used on cases that met the sterling silver standard. The triangle within the top of the octagon is the town mark the Birmingham Assay Office used on foreign items. Both cases have the date letter "n", which was used by Birmingham from July 1887 to June 1888. These watch cases must therefore have been hallmarked between 1 January 1888, when the provisions of the 1887 Merchandise Marks Act came into force, and 30 June 1888, after which the Birmingham date letter punch was changed. The sponsor's mark FP incuse within an incuse oval surround was entered at the Birmingham Assay Office by Fritz Petitpierre on 11 November 1882. Petitpierre was a Swiss watchmaker and importer with offices at 66 Holborn Viaduct in London. He had been an partner of the importer Antoine Castelberg until the latter got into financial difficulties, which caused him to leave the partnership in May 1878 and Petitpierre to enter his own sponsor's marks at the Chester Assay Office on 18 June 1878 and the London Assay Office 22 November 1878, and later at the Birmingham Assay Office in 1882. Many Swiss watch cases with British hallmarks from this period carry Petitpierre's sponsor mark. The sponsor's mark EL in cameo within an rectangular surround with round corners was entered at the Birmingham Assay Office by Edward Ling, listed as ‘Watch manufacturer and jeweller’ and also as ‘watch maker and jeweller’- addresses given as 41 Hatton Garden and 321 High Holborn, first punch registered 1st June 1886 and another punch on 26th January 1888. Although it was a legal requirement that gold and silver watch cases be hallmarked in a British assay office before being put on sale, this had been ignored for imported watches for many years. 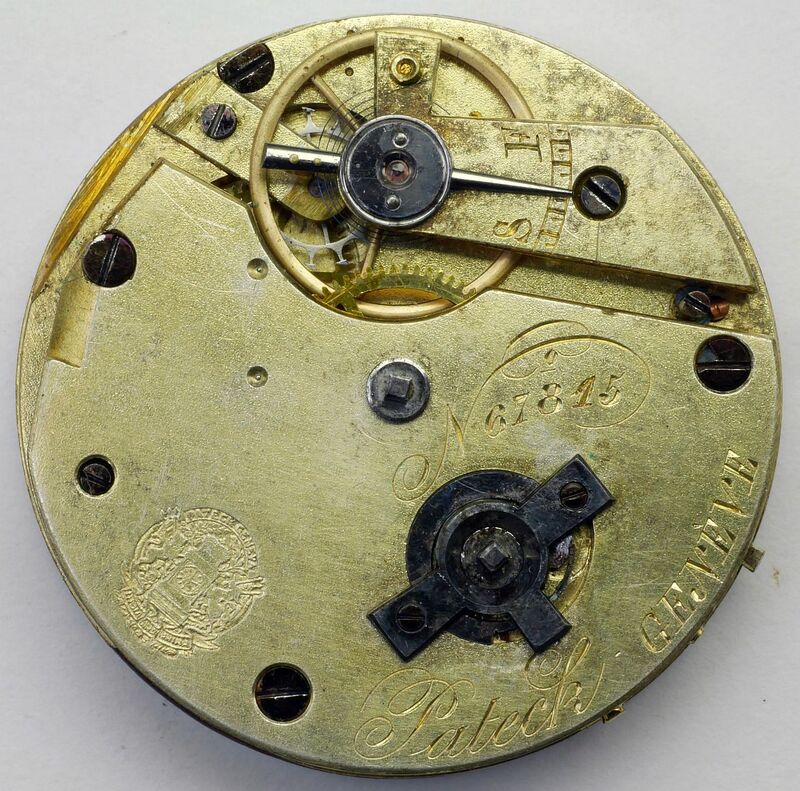 When some Swiss cases began to be hallmarked in the 1870s, perfectly legally and actually in line with British law, English watchmakers complained that this made it easy for the watches to be passed off as English manufacture, undermining their trade. The 1887 Merchandise Marks Act was intended to rectify this by specifying that different marks were to be used on foreign watch cases. But it went further than necessary. 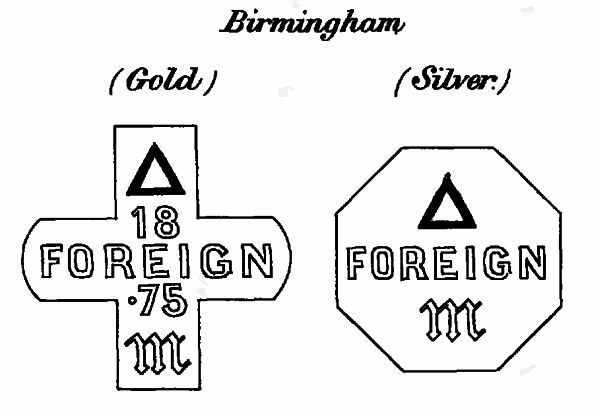 It would have been one thing to replace the familiar marks of the lion passant on silver and crown on gold with something else, but the use of the word FOREIGN placed prominently at the centre of the punch mark could not be anything other than a deliberate slur on the quality of the item. It is little wonder that foreign manufacturers would not want their watch cases marked with such a hallmark, so from 1 January 1888 onwards, until 1907, the situation reverted to the (illegal) status quo ante and very few foreign watch cases were marked with British hallmarks. The form of the new marks is shown here. The town mark, in this case the equilateral triangle of the Birmingham Assay Office, is within the mark at the top. The lion passant of sterling silver and the crown marked on gold, which were often assumed designate English origin, were not used; the outline shape of the punch mark was itself was the standard mark. 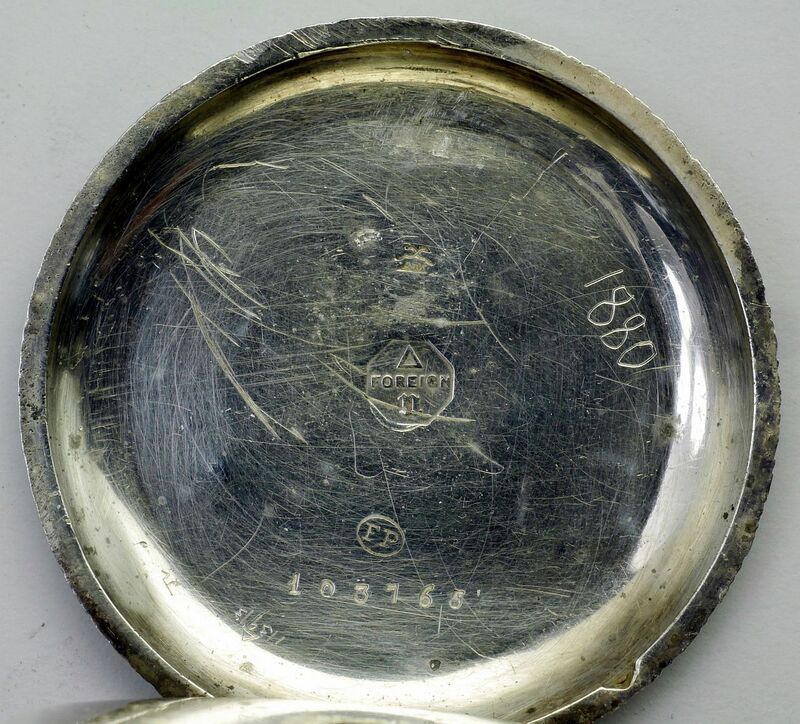 For silver, an octagon outline was for cases containing at least 92.5% fine silver, that is sterling standard. There was no provision for marking foreign watch cases with the higher Britannia 0.9584 standard. The marks to be used on gold cases had the outline of a cross, with the fineness shown in carats and decimals, e.g. ‘18’ and ‘.75’ for 18 carat gold as shown in the image. The additional standards of gold that had been made legal in 1854, 15, 12 and 9 carat, were to be marked in a similar way with carat and fineness, e.g. 9 and 0.375 for 9 carat gold. The ‘Foreign’ hallmarks are so ugly that I wonder whether Petitpierre and Ling were unaware of the legislation until some watch cases came back from being hallmarked carrying the new marks. It is difficult to image anyone actually sending in cases to be marked like this, and they must have had a fit when they saw them! The fact that the watch cases in the images were both hallmarked in the first half of 1888 supports the idea that either Petitpierre and Ling were not expecting the new mark, or that the cases were submitted in late 1887 before the Act came into force, but which were not marked until January 1888. 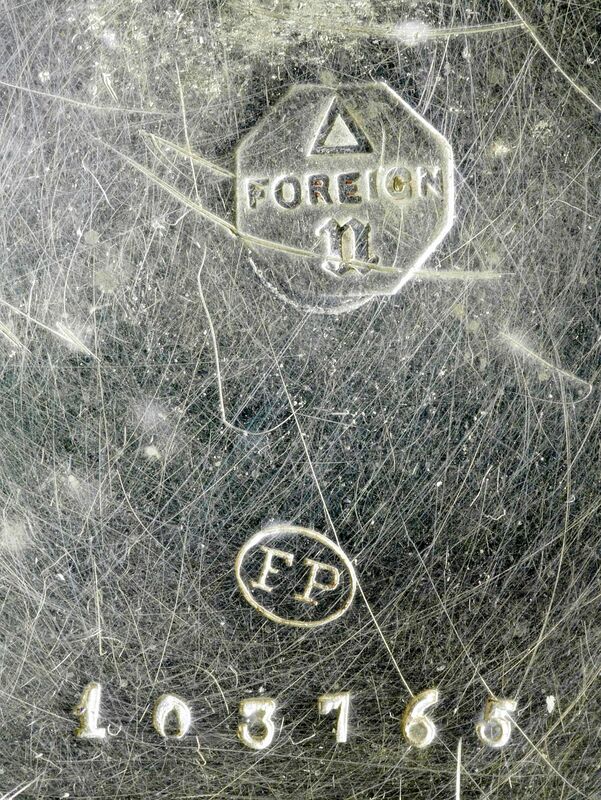 It is not known how many watch cases were marked with the "foreign" hallmarks. It seems likely that it was a very small number, perhaps in the tens rather than hundreds. Further work at the assay offices to go over their records is required. It is also possible that these hallmarks are not well known because very few people recognise them as hallmarks. If you have a watch with one of these "foreign" hallmarks, please let me know. "Pateck" Pocket Watch. Click image to enlarge. "Pateck" Pocket Watch Case. Click image to enlarge. "Pateck" Pocket Watch Movement. Click image to enlarge. 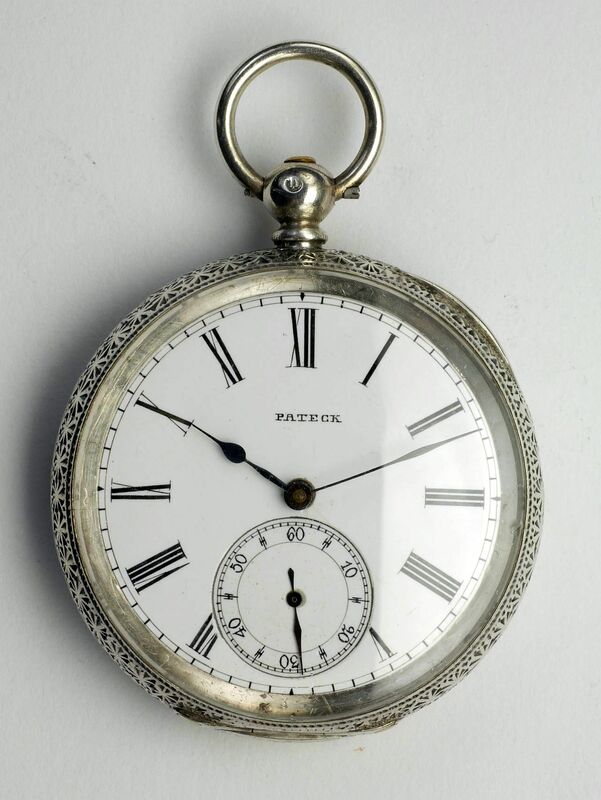 "Pateck" Pocket Watch Trademark. Click image to enlarge. The watch in the case with Fritz Petitpierre's sponsor mark has the name "Pateck" on the dial and movement. This watch has nothing to do with the watchmaking company Patek & Cie or Patek Philippe, but it was a blatant attempt to cash in on the name of the famous company. Founded in 1839 by the merchant Norbert Anton de Patek and the watchmaker Franciszek Czapek (both from Poland, although Czapek was originally Czech), Patek & Cie later became Patek Philippe when Patek's agreement with Czapek ended and Patek took the French watchmaker Jean Adrien Philippe into partnership. The company was so successful that by 1850 the first "Patek forgeries" had appeared on the market. The watch here is one of those. The watch has a basic key wound and set movement with cylinder escapement and no train jewels. Other Patek forgeries were better quality. The movement is signed "Pateck Geneve" with a fancy serial number. Interestingly, the regulator scale has "SF" for Slow and Fast rather than "AR" for Avance Retard, suggesting that it was intended for an English speaking market. The movement also carries a stamped trademark that I have enlarged. 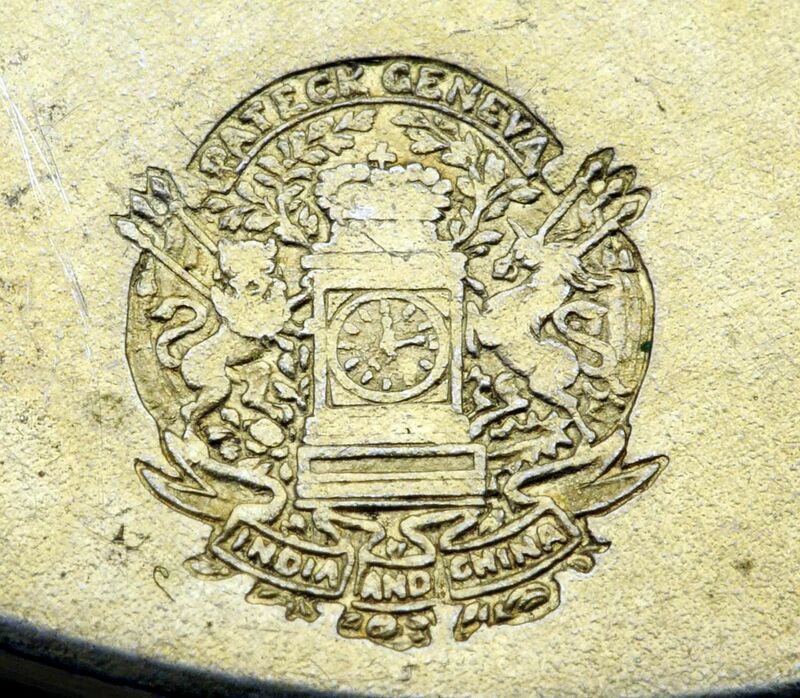 It says "Pateck Geneve" at the top and "India and China" at the base. In the centre is a clock surmounted by a crown, with a lion on the left side and a unicorn on the right. The three things that look like arrows sticking up behind each animal are flag staffs. Watches signed Pateck like this one were made by Armand Schwob & Frère of La Chaux de Fonds. The stamped trademark was registered in England by George Holloway of 128 Minories, London, in 1876. A note in Kochmann says that the trademark was in use for 15 years before 1876, that is 1861. The reason for this is that the British Trade Marks Journal was first published in 1876, following the passage of the Trade Marks Registration Act in August 1875. This presented the first opportunity to register trademarks that were already in use. The watch and its case are undoubtedly Swiss made, so presumably there was some connection between Schwob and Holloway. We have already noted that the SF on the regulator scale suggests that the watch was intended for an English speaking market, which the Holloway connection suggests was England itself. Patek Philippe watches had come into fashion during the Great Exhibition of 1851 when Prince Albert purchased one for himself and one for Queen Victoria. Trademark and copyright law was only in its infancy at the time this watch was made, which is perhaps why Schwob thought they could get away with this blatant act of forgery. Or perhaps because the watch was to be exported they thought that Patek Philippe would not hear about it or be able to trace its origins. In 1886 Patek Philippe sued Schwob & Frère for forgery and damages. The final judgement was handed down in 1891. Schwob & Frère was forbidden to use the names Patek or Pateck and fined 15,000 Swis francs. As a result of this, Schwob & Frère went into liquidation in 1892. 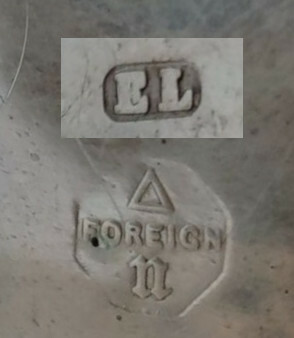 In addition to the "foreign" hallmark and Petitpierre's sponsor mark, towards the top of the case back above the hallmark, are the initials AM under two crossed snakes. This is a bit faint in the image, sorry. This is the trademark of André Mathey, a gold and silver watch case maker of La Ferrière, registered 27 March 1886. Mathey evidently had a thing about crossed items because he also registered two trademarks with crossed swords. Someone has scratched "1880" into the case back, presumably a guess at the date of manufacture. The hallmark date is definitive and gives the date of 1 January 1888 to 30 June 1888 as I explained above. Evidently the person who scratched the 1880 didn't recognise that it was a hallmark, which is not really surprising! Copyright © David Boettcher 2006 - 2019 all rights reserved. This page updated March 2019. W3CMVS.